The $750,000 donation will help make university a “hub” for Korean studies in D.C. and internationally, institute director says. A GW alumnus and his wife have made a $750,000 gift to GW to support the Institute for Korean Studies at the Elliott School of International Affairs. The fund creates the Tom and Pearl Kim Endowment, which will enhance the institute’s work, especially in forging links between the humanities and other disciplines and schools at GW while promoting collaboration among scholars and policymakers who are critical to the overall field of Korean studies. The Institute for Korean Studies, launched in January 2017, comprises an interdisciplinary group of core faculty from the Elliott School and Columbian College of Arts and Sciences. 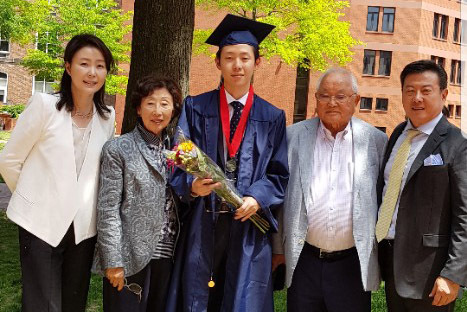 “On behalf of the Elliott School, I’d like to express our gratitude to the Kim family for their generosity and support of the GW Institute for Korean Studies,” Dean Reuben Brigety II said. “This gift will grow the existing Korean Studies program and ensure that rigorous scholarship of the Korean humanities will continue for future generations to benefit from." GW and Korea maintain a strong relationship: With nearly 1,000 alumni, the country is home to the largest number of GW alumni living outside the U.S. More than 200 students from Korea are currently studying at GW. The relationship will now grow stronger.